Summer pinesap plants are fleshy and amber-colored, like the sap of pine trees. Each plant has a cluster of nodding blossoms. Pinesaps grow near pine trees, like these two under red pines by the Westborough Reservoir at the Bowman Conservation Area. This summer’s heat and regular rains have been good for the green things in Westborough’s woods, as well as some things that aren’t green, such as the small, fleshy pinesap plants. The name pinesap hints at this unusual plant’s appearance and location. 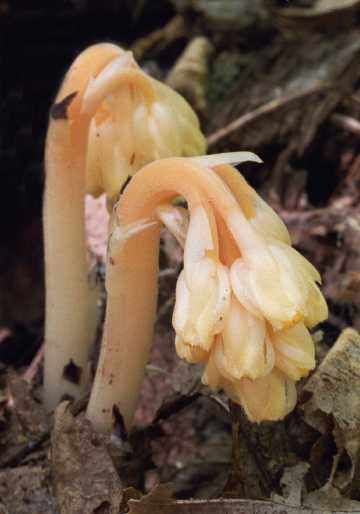 Pinesap (Monotropa hypopithys) plants grow 4-12 inches tall and are amber-colored in summer – the color of the pine sap that oozes from the trunks of pine trees (and forms amber if it fossilizes). Not surprisingly, you’ll find pinesaps in the woods under pine trees. Another name, yellow bird’s-nest, describes the plant’s tangle of roots. As plants go, our native pinesaps are strange looking. They have no green chlorophyll, and no real leaves, just scales on the stem. They do have clusters of downward-facing blossoms, which are about the same color as the rest of the plant. People sometimes think pinesaps are a kind of fungus or mushroom, but they’re not. Pinesaps might remind you of that other strange-looking plant of summer’s woods, Indian-pipes (Monotropa uniflora), which are ghostly white. Sure enough, Indian-pipes are closely related to pinesaps. And both are flowering plants that produce nectar, pollen, and seeds. One clear difference between summer pinesaps and Indian-pipes is color – amber versus white. Another difference is the number of blossoms on each plant. 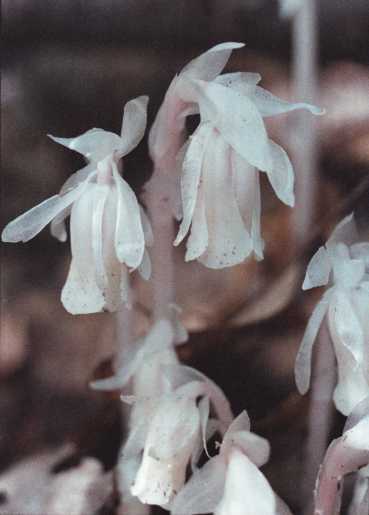 Each pinesap plant bears a cluster of blossoms, while Indian-pipes have only one flower. Pinesaps are less common than Indian-pipes in our area. How do both of these strange, pale plants manage to live without green chlorophyll, the plant world’s greatest sunlight-capturing and food-making chemical? Without it, they can’t make sugars as green plants do. How do they get sugars to fuel their growth? You might find some clues when you look around the woods and notice what’s thriving in this summer’s heat and wetness. You’ll probably see mushrooms and other fungi that have popped up on the forest floor, and of course, lots of trees. As it turns out, both fungi and trees help to sustain pinesaps and Indian-pipes. The connections are hidden underground, where we can’t see them during a walk in the woods. In a wonderful example of connectedness in the natural world, pinesaps and Indian-pipes are linked to underground fungi, and the fungi, in turn, are connected to tree roots. Sugars made in the leaves and needles of trees flow through the tree roots to the fungi and from there to the little pinesaps and Indian-pipes. The key middleman in these connections is the underground fungus. Vast networks of thread-like fungi live in the soil, and we typically become aware of them only when conditions are right for reproduction and mushrooms spring up to distribute spores. Many kinds of fungus form beneficial partnerships with green plants, including trees. The fungi grow around and into plant roots – sometimes between the cells of the roots, and sometimes into the root cells. Science has given this mutually beneficial partnership a name that means “fungus roots.” (The name is mycorrhiza, pronounced my-co-RISE-ah). We tend to associate fungus with death and decay, but fungus-root partnerships are all about thriving and growing. Both plants and fungi gain advantages from the partnership. The fungi get some of the sugars that the green plants manufacture. And the plants? Their root systems can reach much farther due to connections with the fungi’s vast, threadlike networks, which help roots to absorb water and minerals from the soil. Fungus-root partnerships are so beneficial that 80 percent of green plants have them. They’ve been a well-kept secret of success in the plant world. Such a partnership enables the seeds of Westborough’s pink lady’s-slippers (Cypripedium acaule) to germinate and grow. Fungus-root partnerships also help tree seedlings to grow. Without their fungus partners, trees grow poorly. For example, the invasive weed known as garlic mustard (Alliaria petiolata) prevents native tree seedlings from growing in clearings by producing chemicals that harm the underground fungi that they need. Ghostly white Indian-pipes are closely related to pinesaps. Each plant bears only a single nodding blossom and resembles an old-fashioned clay pipe. How do pinesaps and Indian-pipes fit in? When these plants link with underground fungi, they tap into existing partnerships between fungi and tree roots. The benefits – sugars, water, nutrients – flow to them. But the flow goes only one way. The pinesaps and Indian-pipes don’t seem to contribute anything, at least as far as researchers have determined. Pinesaps and Indian-pipes are sort of like laptop users who sign onto their neighbors’ wireless networks. Researchers will probably learn more as they study fungus-root partnerships in the search for ways of making crops grow better. Additional connections may be involved. For instance, researchers are looking into the role of bacteria. They suspect that bacteria may play a part in helping fungi and plant roots recognize one another and set up partnerships. In the past, pinesaps served as an ingredient in some Native American love potions. To find pinesaps at this time of year, check the Bowman Conservation Area. Look under the towering red pines planted many years ago on the steep hillsides near the Westborough Reservoir. If you miss seeing pinesaps in the summer, you may get another chance in early October, but they’ll be a different color. Fall pinesaps are red, like autumn foliage. Check the sides of trail leading from the Haskell ball fields to the Westborough Community Land Trust’s Hero property. Are fall’s red pinesaps the same kind as summer’s amber ones? A genetic analysis of pinesaps from various parts of the country, including Westborough, says yes. The red and amber pinesaps are different forms of the same plant.